Weekly Twice-a-Day Pill Organzier by Carex allows you to easily and conveniently manage your daily pill or vitamin regimen. The contoured inner design helps to remove pills without difficulty, while the tabbed compartments open easily and securely snap shut. Weekly Twice-a-Day Pill Organizer is designed with bold AM/PM highlights for easy identification, clearly helping you keep track of which pills you have and have not taken. The attractive white base is paired up with a wide variety of stylish colors. 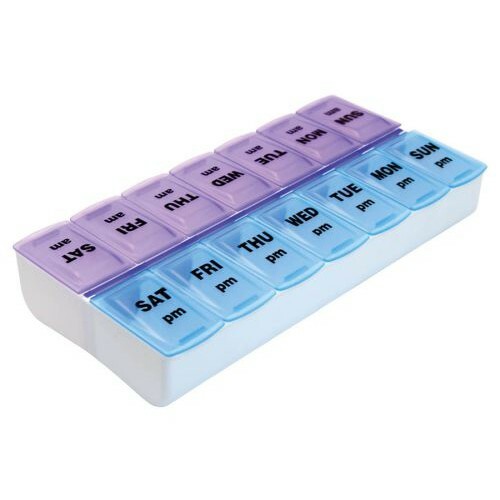 Choose the Weekly Twice-a-Day Pill Organizer today to help manage your medication needs! The 7-Day AM/PM XL Detach N' Go Pill Organizer is the perfect choice for anyone on a twice-a-day medication or vitamin schedule. 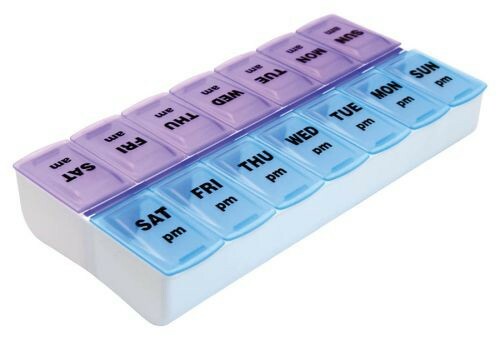 Vitality Medical also carries other pill organizers and calenders, such as the Weekly Pill Organizer by Medline. Contoured Design For Easy Pill Remover. The Tabbed Compartments Open Easily and Securely Snap Shut. White Base With Color Combo Lids.